28MPG??? Wow, I've never done much over 14mpg with mine, most tanks are in the 12's and 13's. My car was tuned for CA 91 octane fuel, and I suspect it might have been tuned on a high ethanol concentration as well, as it runs quite rich on the 0% to 10% we have here. I plan to pull the drivetrain this winter, and probably go through the motor to freshen it up and check everything out. I also plan to install a Megasquirt Pro. I look forward to doing my own tuning, and I suspect there is even more power AND better economy in this motor. I can't remember if Lane cam'd the engine. What profile? Been putting on some more miles and the car is nothing short of amazing. It puts me in a weird happy but scared mode when I drive it! I got some time to myself today and worked on tracking down the major rattle at idle that was loud and annoying the heck out of me. 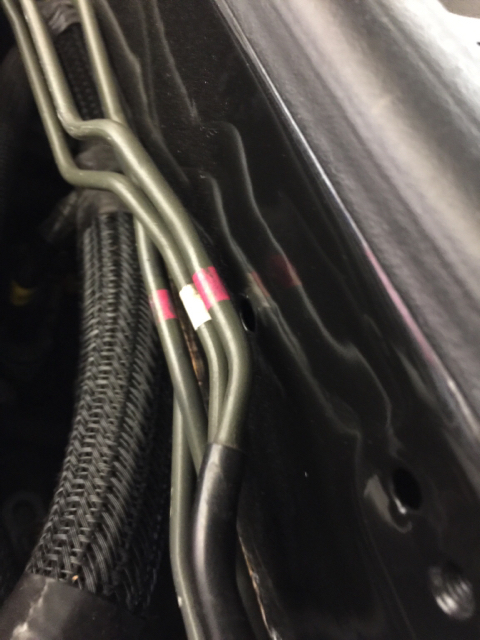 After combing under the dash I was under the hood and I noticed some wear in the POR15 coating in the engine bay behind the brake lines. I stuffed a rag in between and sure enough the noise is gone! Pulled the rag and it came back. So I got some rubber insulation and placed it on the lines and the car is noise free at idle...yay! 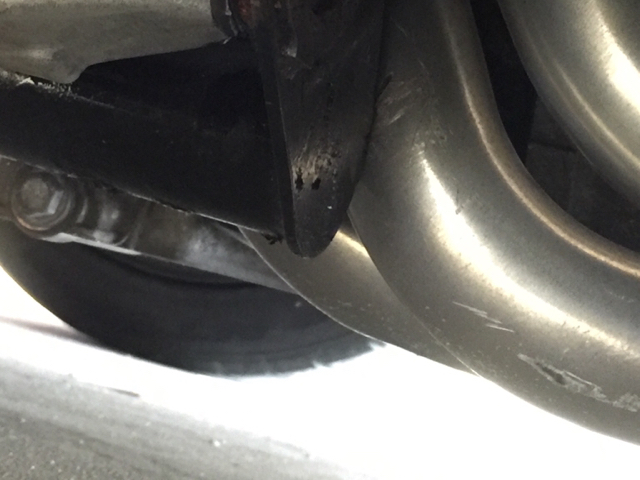 I was looking at the exhaust wanting to quiet it some and I noticed my JTR headers hitting the samberg subframe. Is this common? Any fixes? These are 1-7/8" primaries. I did have the MIL come on so I ordered a ELM327 and looking for apps now to scan it with. I do have a appointment on the 11th to go speed density if he can't get the MAF dialed in. It's close but I get some bucking and have some minor issues with the AC on wanting to stall while coasting. It's cool the tuner is CJs in St. Paul and seems very smart on this. Plus I like his process I bring it in the morning and he works with it all day than lets it sit over night and works the cold start in the morning if needed. I said I want it OEM like control cold or hot and he said that is the only way he does them He comes highly recommended by many swap guys up here and knew the problems with a MAF on the OTR set up like the samberg intake. Lastly programmed my Gentex auto dimming mirror for my garage and finally can ditch the garage door opener. So the car is rattle free and I hope the tuner makes her run as smooth as silk. All in all a good day. Anyone know how to refurbish the AC button? Any overlay kits available? Mazda doesn't sell the button plastic or the AC switch separate from the HVAC panel and they don't sell HVAC panels anymore so there are no sources for buying one new. No known aftermarket replacements. I took full advantage of known aftermarket parts when rebuilding the panel. That leaves you with the used market or trying to commission someone like Broadfield or someone else that's an artist with refurbishing / recoating plastic parts and/or silkscreening. No idea about the JTRs. I knew the install was close but didn't realize they were making contact with the subframe. Not a lot to update but I have had a few issues that I got resolved and will post them here if nothing else for documentation purposes for the car. #2 A issue that came with the car since the day it showed up on the trailer - Click click start that is so common on FD's. Lane has been most helpful here helping me understand the wiring. 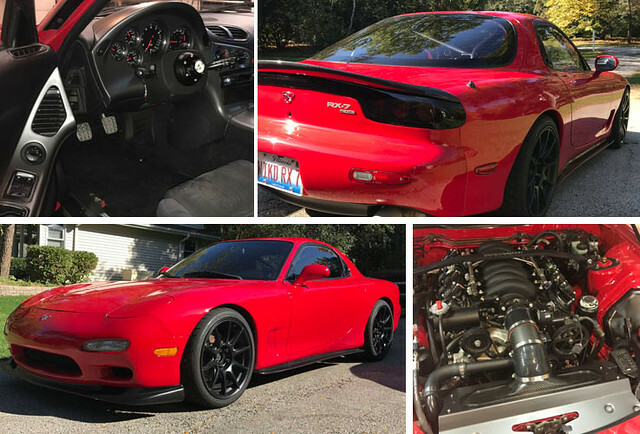 Basically he eliminated the stock security relay and ran the starter cut though the Viper alarm, everything else is stock. Well after thinking it was maybe a loose starter wire as it would get better and not occur when warm, I found the issue to be the clutch interlock switch. Its funny because when I ohm it out, it works perfect with the pedal showing open until you press the clutch, than I get random Ohms on each clutch press, 5,6,7 ohms. I read on the club it should be <5 ohms. I bypassed it with a jumper wire on the harness side and its been flawless since. Eventually I will replace that switch but its buried up there! One problem I still haven't resolved is of all things the gas cap. Lane has a sealed gas tank from the PO and used a vented cap and actually modified to flow both ways with no valve. I was doing some 'spirited' driving after just filling up the tank and noticed gas was running right out of it on a hard right hand turn! I called Stant to see what they recommend and they said they have nothing?! WTF? I will figure something out. Tell me about it! It was a big gulp to pay that bill! They really are worth it though, people think its a exotic car and the taillights no longer give its 90's vintage away. They are one of my favorite parts of the car, I freq roll around with the parking lights on during the day just to show them off LOL. Coming back to the bucking, does this happen at cruise on very light throttle openings? In our case using an LS3 with the Samberg MAF elbow we initially used a honeycomb MAF guide which improved things by 75% or so but it was still not perfect. Reading the GM crate engine installation notes we noted that the MAF should be fitted centrally in a 10" length of 4" diameter straight tube; that was never going to happen due to space restrictions but we tried a slightly shorter straight tube and used a tighter silicone bend onto the filter, this time without the honeycomb. The hood still closes fine and the bucking is all but gone. Combined with a tune I think it would be possible to totally eliminate the bucking with a standard cam, the larger cam in yours may be slightly more difficult. I'm telling ya, one you go SD, you'll never miss MAF. That's my plan when I switch to MegaSquirt Pro. Did I miss the discussion on the J pipe drone eliminator! More info please.